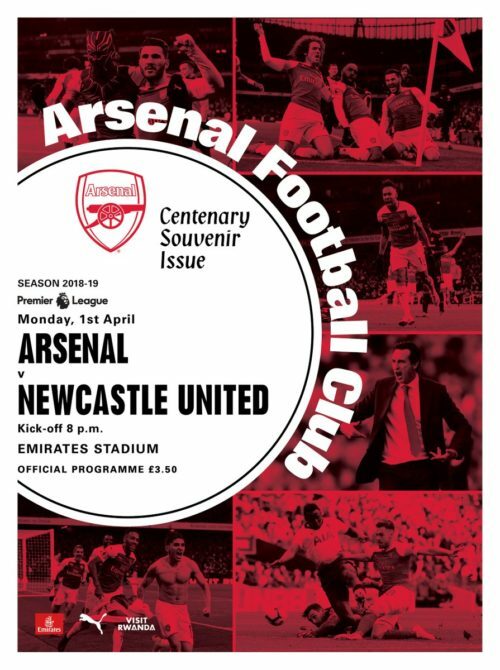 Arsenal made their Football League debut in a Second Division encounter against Newcastle, who were also making their league bow, on 2 September 1893 at the Manor Ground, Plumstead. After just six minutes of play, Arthur Elliott broke through, fed Charlie Booth on the left wing and his cross found Walter Shaw who, with a terrific shot, put the ball into the net just out of Alex Ramsay’s reach. This maiden League goal was met by rapturous applause from the crowd of 10,000. Shortly after the break Woolwich Arsenal went further ahead when, following an impressive solo run from his own half by Booth, Elliott beat Ramsay with a stinging shot. Arsenal eased off allowing Newcastle to press and, after 65 minutes, Tom Crate scored through a melee of players. This goal spurred the Magpies on and Jock Sorley netted shortly afterwards in similar fashion, and the game ended in a 2-2 draw. It was also the Magpies who played Woolwich Arsenal in the Gunners’ first ever game in the highest echelon on 3 September 1904 at St James’ Park in Division One. This was also the first match in Newcastle’s first ever League title winning campaign. The crowd of 25,000 enthusiastically received both sides and acknowledged Arsenal as a welcome newcomer into the top flight. The champions-elect opened the scoring in the tenth minute when, direct from a corner, Jock Rutherford beat Jimmy Ashcroft in the Woolwich Arsenal goal. Ronald Orr then scored twice in the 62nd and 86th minutes to ensure Newcastle gained a 3-0 win. The game had been well contested; Arsenal, while beaten, certainly did not disgrace themselves in their inaugural match at this level. A big difference between the sides was in front of goal – while Arsenal were hesitant and wasted their chances, Newcastle were clinical. The Arsenal’s first game in the 100 year sequence was against Newcastle on 30 August 1919. It was also the first ever top flight game at Highbury, and the first competitive game since World War One ended. This exciting restart to peacetime football led to massive queues at Kings Cross, snaking all the way to St Pancras train station, for the tube to Gillespie Road on the day of the game. The gates had to be shut before kick-off with many thousands still outside. However just prior to kick off some gates were forced open allowing many of the throng outside to push in and gain entrance without paying. The crowd of ‘40,000’ witnessed a tight match which was won in the 25th minute when James Henderson thundered a shot past Ernie Williamson. Henderson had scored with their only meaningful shot of the afternoon allowing Newcastle to take the points back to the North-East with the 1-0 win. On 9 November 1968 Arsenal chose to celebrate their 50th consecutive year in the top tier of the English game with a Division One match against Newcastle. 34,277 spectators witnessed the ‘Jubilee match’ on a sunny afternoon but it failed to live up to expectations ending goalless despite George Graham and John Radford’s best efforts as the Gunners strike pair. Both sides had good shouts for goals in the second half: Arsenal when a Jon Sammels strike was handballed off the line and over the crossbar by ‘Pop’ Robson but was unseen by the referee. Newcastle were convinced a Jackie Sinclair strike on the hour was good, but was disallowed for offside. After the game, Arsenal held a banquet and dance for 400 guests at the Park Lane Hotel, Piccadilly, that same night. Former and current players and dignitaries from both clubs were prominent as the party went into the small hours. Jock Rutherford played for the Gunners in 1919, but 15 years earlier he had appeared for Newcastle in the 1904 game against Arsenal. Approximately 500 ex-military and wounded soldiers were given free entry to the game. Bill McCracken, Newcastle defender in the 1919 game, was the only player from either side present at the 1968 celebration game and dinner. Arsenal Honorary Steward Claude Stevens was the only Arsenal representative at both the 1919 match and the 1968 dinner. He occupied this role at Highbury for 57 years between 1913 and 1970, second only in Gunners length of service to our own Ken Friar. In these commemorative games, the only time the Gunners scored was in the opening match in 1893. This is verbatim from our article that appeared in Monday’s programme.